Yakutian snow sheep (Ovis nivicola lydekkeri), Suntar Hayata Mts, Yakutia. Bighorn sheep (Ovis canadensis) are widespread in the mountains of western North America. They are closely related to (and probably conspecific with) the rare snow sheep (O. nivicola) of Siberia. There are three to nine slightly differing subspecies and many isolated populations, some of wich, such as Black Hills population (often called O. c. audubonii), are already extinct. Anza Borrego, California. 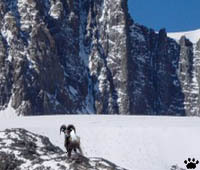 Rocky Mountains bighorns (O. c. canadensis) are common and easy to see in the Rockies and the Cascades of the US and Canada. The second large subspecies, California bighorn (O. c. californiana) of the Sierra Nevada, is now numbering less than 100 in the wild. Smaller desert bighorn (O. c. nelsoni, possibly synonymous with Mexican O. c. mexicana, peninsular O. c. cremnobates, and Baja O. c. weemsi bighorns) is widespread from interior British Columbia to northern Mexico, but is declining in many parts of its range because of habitat loss, diseases brought by domestic sheep, and sometimes poaching. Bighorn rut, Sybille Wildlife Area, Wyoming. 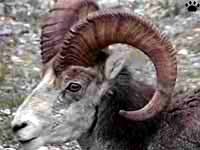 Bighorns are tough and athletic animals, capable of surviving in hot dry deserts as well as in cold Alpine tundras. Bighorn jumping a fence, Sybille Wildlife Area, Wyoming. Forbidden games, Sybille Wildlife Area, Wyoming. Bighorn calf, Cybille Wildlife Area. In the North, they are replaced by Stone sheep (O. dalli stonei) of Yukon Rockies, and by white-colored Dall's sheep (O. d. dalli) of Alaska. 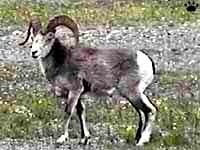 In one area of Yukon, there's a hybrid population of the two O. dalli races, known as Fannin sheep. Bighorn calf, Cybille Wildlife Area. Stone sheep, Stone Mt, Brit. Columbia. Bighorn track, Sybille Wildlife Area, Wyoming.